The Greens in particular, had substantial gains – not only securing the demise of the oil and gas industry and the end of large-scale irrigation, but their radical agenda to de-carbonise New Zealand’s economy is now on track to become law. While Conservation Minister Eugenie Sage remains committed to pushing ahead with an irresponsible plan to ban new mining on conservation land – in spite of it being standard practice in regions like the West Coast where 81 percent of their area is conservation land – the Associate Minister of Transport Julie-Ann Genter appears to have backed off her foolhardy ‘zero road death by 2020’ policy, which could have only been achieved through zero car movements! The Green Party’s plan to decriminalise marijuana received a major boost late last year when Labour passed a law to not only allow end of life patients in need of palliative care to smoke cannabis in public places, but also an estimated 25,000 other people who say they suffer from chronic pain. These changes are expected to smooth the way for a yes vote in the binding referendum on legalising cannabis for personal use that will be held at the 2020 general election. For New Zealand First, their wins have been aimed at fortifying their voting base. Shane Jones’ billion dollar regional development slush fund is designed to build support in the regions – especially in the Northland electorate where he is likely to stand. Their plan to include provisions for a nationwide referendum on the future of the Maori seats in a Private Members Bill to entrench the seats, is aimed at winning the support of those who oppose race-based privilege. Their goal of increasing the minimum wage to $20 an hour by 2020, is no doubt intended to grow support amongst low income workers. However, the policy is having a far wider impact by making it uneconomic for many small businesses to hire extra staff. In addition, the knock-on effect, whereby the wages of other employees have to increase to preserve parity, is resulting in consumer price rises as businesses struggle to maintain profitability. Against that backdrop, Winston Peters no doubt felt his stint as acting Prime Minister would have won him some long term support, but his decision to secretly sign the UN global migration compact, which is designed to open borders to illegal immigrants, was seen by many New Zealand First supporters as a betrayal that undermines national sovereignty. As far as the Labour Party is concerned, they seem unable to put a foot wrong in the eyes of the media and their supporters. As a result, their honeymoon continues and they remain immune from almost any form of criticism or responsibility – including for reported increases in homelessness and poverty. Even the Kiwibuild housing debacle, which is predicted to continue this year as the number of houses being built remains well below the levels promised, is not creating a storm of protest. Labour would have been relieved to have secured bipartisan support from National (which will effectively constrain their opposition) for their child poverty legislation and, unbelievably, their climate change plans, even though a radical socialist agenda clearly underpins this programme. The final poll of the year put Labour on 43 percent, well ahead of their election night result of 36.9 percent. The Greens on 5 percent would have been relieved not to have slipped further from the 6.3 percent they won at the election. New Zealand First fared the worst, falling from 7.2 percent at the election to 4 percent. Even with New Zealand First out of Parliament, on those numbers, Labour and the Greens would have a majority of 61 seats in the House compared to National and Act on 59. Although National has maintained public support, polling at 46 percent – a few points ahead of their election night result of 44.4 percent – it was a difficult year for the Party as they adjusted to life in opposition and coped with the Jamie-Lee Ross affair. Unfortunately for leader Simon Bridges, the leaks he blamed on the errant MP are still occurring. 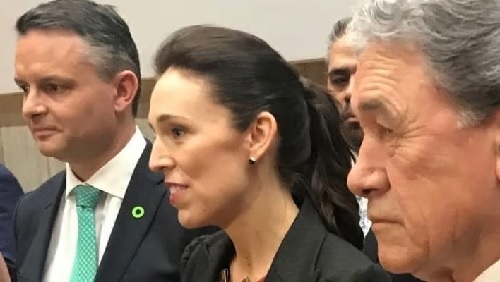 In addition, while Jacinda Ardern is attracting 39 percent in the preferred Prime Minister stakes, his 7 percent, remains stubbornly low, fuelling the inevitable rumours of a leadership change. Such speculation, which is now being driven relentlessly by National’s opponents, can be destabilising for a party, especially if other MPs rise above their leader in the polls. Looking ahead, dozens of the working groups that Labour have set up will be delivering their policy recommendations this year. One of the first to report back – and one that is likely to dominate the agenda right through to the next election – is the Tax Working Group, which is expected to recommend one of the highest capital gains taxes in the world. Set at an individual’s top marginal income tax rate of up to 33 percent, it would be more than double the 15 percent rate proposed by Labour before the election. With his ‘rich-prick’ philosophy, group chairman Sir Michael Cullen, is apparently planning to tax all profits made from the sale of assets and investments – including boats, baches, rental properties, businesses, and shares – at a person’s full marginal tax rate. But would such a harsh regime be fair, when most other countries either tax only a portion of such gains, or the full gain at a lower rate? And is it wise to tax capital at such a high rate in New Zealand, when, as a country, we consistently underperform economically because of a chronic shortage of capital? With the Minister of Finance cunningly asking for any tax proposals to be revenue neutral, a tax-free threshold of $7,000, or a lowering of the bottom tax rate to 5.25 percent from 10.5, are two options being proposed as an equivalent $2 billion tax cut trade-off. While this will be used as a bribe to sell the policy, the Minister knows full well, that although the initial return from a capital gains tax may be as low at $2b, over time it would rise to more than $10b a year, amounting to a significant tax increase for New Zealanders. In May, Finance Minister Grant Robertson is planning to introduce his ‘Well-Being’ Budget. Based on Treasury’s Living Standards Framework, it will measure government success, not only in terms of economic growth, but also such things as happiness, well-being, and life fulfilment. To progress this change, State Services Minister Chris Hipkins is planning a radical overhaul of the State Sector to make it easier for Government agencies to work together to solve the kind of problems the Living Standards Framework will identify. This year the Minister for the Environment David Parker will push ahead with his controversial plan to make rivers swimmable by 2020. He wants agreement between iwi leaders, local authorities, and farmers for new National Environmental Standards. While the changes to the Resource Management Act that will be necessary are expected to lead to wider reforms, it seems unlikely that the Minister would undertake the complete overhaul of the Act that is now needed. The reality is that the RMA has become a significant regulatory burden on the country, holding up progress, forcing up costs, and preventing New Zealanders from being able to undertake projects in a timely fashion. It is also largely responsible for New Zealand’s seriously unaffordable housing. National, of course, understood this when in government, yet many of their RMA changes, such as the requirement of local authorities to empower iwi and establish multiple participation agreements, have made the situation worse. A case in point is the Craggy Range debacle, whereby a Hawke’s Bay winery built a walking track to Te Mata Peak on their own land and with the full approval of the Hastings District Council, only to find that a local iwi eventually objected and launched a vendetta against the winery. To get them off their back, the winery – at considerable cost – has not only agreed to join the iwi in purchasing land for a new walking track, but they will also try to remove the old one, highlighting the absurdity of a situation where an iwi has been allowed to impose its cultural and financial interests on a consent applicant. In opposition, Winston Peters committed to removing all references to race from the RMA. Now that he’s in a position to do so, he needs take a lead in bringing about proper reform. On the social front, a combination of proposed policy changes will have a disastrous impact on New Zealand, by entrenching an underclass of benefit dependent families and significantly increasing the risk to their children. While the Government likes to gloat that raising the minimum wage to $20 an hour benefits low income workers, what they don’t acknowledge is the damage this policy is causing to those tens of thousands of vulnerable New Zealanders, who already face substantial barriers to employment and who will no longer be able to find a job because it’s uneconomic for businesses to hire them. Furthermore, if the welfare working group reports back with recommendations along the lines of those proposed by Metiria Turei, before she resigned as Green Party co-leader, to remove the sanctions that presently require able-bodied beneficiaries take jobs, the result will be a permanent dependency trap. When a lack of jobs is combined with the hopelessness of intergenerational benefit dependency, the impact of the Government’s plan to legalise cannabis will have a devastating impact on families – especially children. This year we can expect increasing pressure on the Government from Iwi Leaders not only for more race-based privilege, but also for further acknowledging that they are in ‘partnership’ with the Crown – a charade that is clearly the forerunner of Maori co-governance. Through their powerful new Office for Maori-Crown Relations – which has already taken over responsibility for Treaty Settlements and for Marine and Coastal Area Act claims – they will no doubt demand veto rights over all new government legislation. Meanwhile, the coastal claims process will continue on throughout the year, as High Court hearings are scheduled and direct negotiations with Treaty Minister Andrew Little begin. This second year of a government’s three-year term is when controversial policies are rushed through Parliament, ahead of election year. With many radical changes being proposed by this Labour-led coalition, it is going to be a very busy and challenging year! Do you believe the Labour-led Government is taking New Zealand in the right or the wrong direction? Our tax is being frittered away on worthless waste. Their promise of thousands of new homes has turned out to be only hundreds and is a complete failure, like the changes to the RMA. The waste of millions on areas like Northland are simply designed to curry election wins in marginal seats. The unemployable are able to get extra benefits with no penalty for not bothering to turn up to appointments. Our fruit crop is likely to be sacrificed as picking fruit is just too tiring for the young looking for a job that pays well and requires no effort. Those of us who have worked and saved are to be targeted by Cullen’s Capital Gains Tax unless we get rid of this Labour Government next year. Peters and NZ First are a useless bunch of yes men and the Greens are a miserable lot of misguided wingers. Chris. The term “Revenue neutral” is quoted in this article. While I think I understand what it means, I have no idea how it is measured, is there more than one way, do different ways bias the result? Would total take take as a percentage of GDP provide a valid indication of how heavily we are being taxed? If so it would be interesting to compare the two figures for the start and end of this term of government. Geoff.